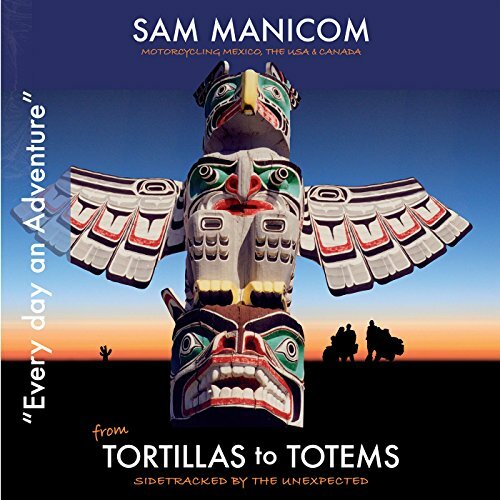 Sam Manicom's dynamic fourth book is an enticing yet frequently challenging motorcycle journey across the dramatic landscapes of Mexico, the United States and Canada. Sam's partner Birgit is no longer a novice motorcyclist - riding through southern Africa and South America turned her into a rider capable of facing any challenge. But Sam was worried. Samuel Johnson wrote, "The use of travelling is to regulate imagination by reality and instead of thinking how things may be, to see them how they are." After all, aren't these some of the main reasons for going travelling? To experience as many different things and ways of life as possible? To discover new and wonderful things, but also to have preconceived ideas challenged. This true-life story has more twists and turns than a Rocky Mountain Pass, and more surprises than anyone could expect. As it did them, at times it could challenge you too. Woven into this surprising story are canyons, cowboys, idyllic beaches, bears, mountains, Californian Vineyards, gun-toting policemen with grudges, glaciers, exploding volcanoes, dodgy border crossings, and some of the most stunning open roads that a traveler could ever wish to see. Absolutely brilliant! I only wish there was another book after this one! I would recommend this to anyone! I've loved every book Sam has release and this one is no exception. It pleases me greatly when an author narrates their own book because they bring to you their actual emotions when they tell their story. Sam does it here again. Bravo Sam. Such a pleasure to experience this book with you. Come back to the USA and really see the country, just avoid the cities and experience real America. I defy you to get this book and NOT enjoy it. Well worth the money and time. I enjoyed the story but the appendix dropped my rating to 2 stars 4 without. Fantastic book, that left me satisfied and ready to explore my own personal world with wider eyes. Sam Manicom does a Fantastic job describing the places he goes. Having lived right next to two of the towns he describes (Concrete Washington and Annacortes Washington) I can say what he described felt honest and at the same time made me wish when I lived there I had paid better attention to what was around me. I really enjoyed this book and cried at the end. Beautifully done Sam. Sam’s authentic storytelling style leads the reader on a rich expertly woven adventure journey. Sam has a unique way of helping the reader relate to foreign worlds through his words, an admirable gift. Through Sam’s courageous and curious approach to his travels, I have learnt to see the positive in the most challenging of circumstances. This master story teller has shared his adventures in a way that is real, sincere and most definitely makes you feel as if you are riding alongside him on the open road. I can almost smell the two-stroke oil as I immerse myself in Sam’s stories. It was a treat to listen to the audio book read by Sam himself. His calm and quirky voice, showcased his sharp wit and excellent sense of humour. As a motorcycle enthusiast and lover of adventure and travel, I have enjoyed each of Sam’s books immensely. I highly recommend that readers should start with Sam’s first book, Into Africa. I guarantee that you will not be able to resist reading all four of the legs and stories back to back. In this, Sam’s latest book, I was particularly touched by the impassioned plea for all people to become organ donors. I have laughed, cried, smiled, shaken my head and been entertained through many long nights while insomnia kept me awake. I know it will take a long time before I find another favourite author. To Sam I say Merci, Gracias, Dankie, Gratzie, Nkosi kakhulu and Thank you for sharing your stories with me and the world. Bravo my friend, bravo. The narration is great. It is so much better when it is the author narrating. The epilogue is very touching and a perfect way to end the series. I had already enjoyed the written manuscript by Sam Manicom, but to have the story told by the author himself brings a different life to the tales of his journey. As always, Sam brings strongly the human side of worldly exploration, the motorcycle Libby being simply the accomplice. Tortillas to Totems is worth the read for any aspiring traveler to the Americas, in any vehicle one chooses. Absolutely. Sam is perhaps the best motorcycle adventure writer of the modern era and one of the better travel writers in general. He does a great job with narration. I am a big proponent of having the author read his/her own work and same does an impeccable job. His enthusiasm draws you in and keep you interested throughout. The recording is also of a very high quality. I own all four of his audiobooks as well as print copies of ""Into Africa" and "Under Asian Skies". I was worried that this, his last book, would be somehow lesser because half of it takes place in familiar, highly developed, and easy to tour countries (America and Canada). Let me say that is not the case. It does have a different feel but makes a good bookend for the series. The first half takes place south of the American border, and is a wonderful adventure in the traditional sense, and will surely appease any fan. Surprising to me is that the adventures in America and Canada were compelling as well. There isnt the sense of the unknown one feels in developing countries but there are still great tales to tell. He made me appreciate many of the sights and experiences I often take for granted. Sam's performances are excellent, surprising since he is not a professional narrator by trade. But generally I prefer an author over a narrator any day. He maintains his enthusiasm throughout and has a voice that doesn't wear on you even after a marathon listening session. There were not standout moments in this book, as there were in his past three books. For me it was more of an overall lesson. There is adventure and something to appreciate everywhere, even in developed places. I can't always get away for months at a time, but I could do several shorter trips. I will surely take more long weekend trips because of this book. All of his books are great. My personal favorite continues to be "Under Asian Skies" but they are all worthwhile reads/listens.